The Bromley Frameless Shower Enclosure combines quality construction with elegant craftsmanship to offer the best in contemporary styling and functionality. Available in a vast array of ready to install dimensions, theBromley frameless shower enclosure is comprised of durable stainless steel hardware and premium clear 3/8 inch tempered safety glass; tested and certified to ANSI Z97.1 Standard with StarCast by EnduroShield coating, that allows your shower to stay beautiful for years to come. The Bromley's inline wall channel provides up to 1 inch of adjustability to ensure a seamless installation, while its hinged door is designed for a left or right-hand opening. Let the Bromley frameless enclosure become your next custom-style, personalized corner showering solution. Shower base not available. Images are for representation only. Once installed, glass may differ slightly than shown in image due to light absorption and reflection. The Coraline Collection of enclosures are as beautiful as they are functional, with premium frosted 3/8 inch tempered safety glass; tested and certified to ANSI Z97.1 Standard and an innovative two-wheeled roller system. The Coraline is available with stainless steel, chrome or oil rubbed bronze hardware options. 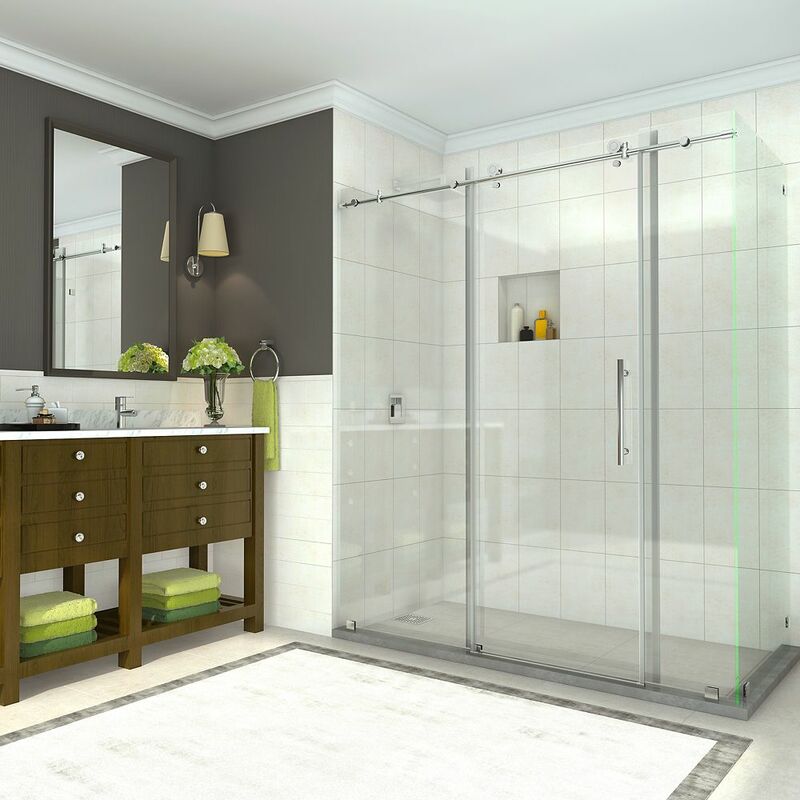 The Coraline Shower Enclosures are available with an optional acrylic shower base. Coraline's variety of finishes and glass styles is sure to deliver style and sleek sophistication to any corner installation. Images are for representation only. Once installed, glass may differ slightly than shown in image due to the nature of light absorption and reflection from your own bathroom's colour, design or decor palette. This is normal and should be expected in certain scenarios due to the glass's natural composition.